With a company history and shipbuilding heritage spanning six decades, Mengi Yay Shipyard is one of Turkey’s premium shipbuilders. Opening its doors in Tuzla in 1984, the yard started turning its shipbuilding expertise to the super-luxury side of the spectrum in the early 2000s. Since then, the Turkish yard has delivered well over 20 superyachts ranging from 19 to 45 metres in length, including the 45-metre luxury motor yacht Aquarius in 2016, and the 32-metre sophisticated yacht Serenitas II in 2017. With the Mengi Yay Shipyard continuing to prove itself in the industry, here we take a look at what’s currently underway there. Mengi Yay invested in new state-of-the-art facilities in 2018. 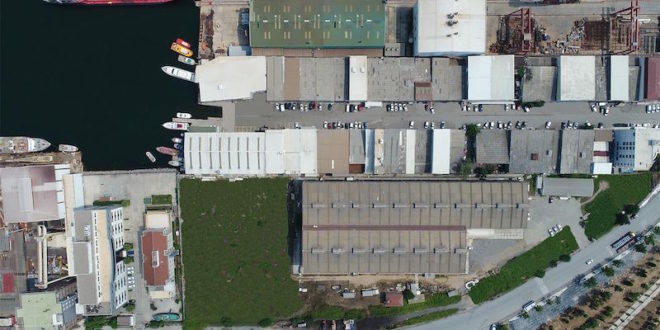 Expanding and renovating its facility in Tuzla, the Turkish superyacht shipyard stated its dedication to providing the best work environment for its engineers and craftsmen. Now with facilities measuring 18,365 square metres, the shipyard will continue to invest in upgrading its to future-proof the business and enable the yard to continue delivering premium yachts to superyacht owners around the world. M/Y Virtus is one of the most exciting projects currently underway at the Mengi Yay Shipyard. 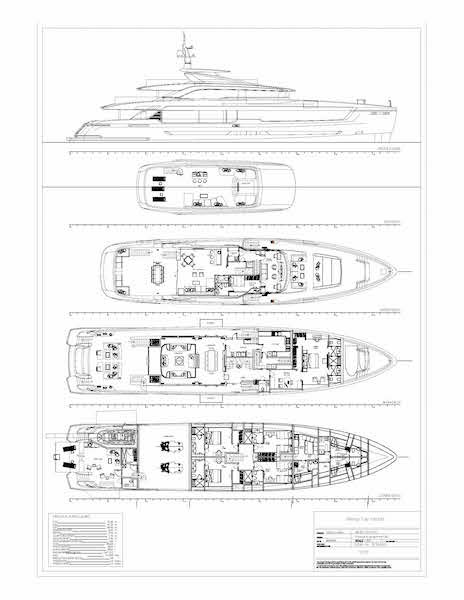 Measuring 44 metres, M/Y Virtus is currently under construction and for sale. As the second largest motor yacht to be built by Meng Yay, Virtus will feature an interior design by VYD Studio, with naval architecture undertaken by Ginton Naval Design – a close collaborator with the Mengi Yay Shipyard. This fantastic new yacht will boast expansive deck spaces, including a spectacular beach club and large foredeck seating and sunbathing area. With completion scheduled this summer, M/Y Virtus certainly offers a unique opportunity on the yacht brokerage market for a new-build yacht at a small fraction of the waiting time. Alongside the financial investment into the expansion and upgrading of the Mengi Yay Shipyard, the yard announced an ongoing commitment to developing more environmentally sustainable yacht building and business practices. This includes a pledge to counteract the yard’s environmental impact with the funding of a tree-planting project, as well as the intention to introduce fully electric and diesel propulsion engines into its new build yacht projects within the next five years. Other innovative green initiatives include the creation of a division that will produce software to measure a yacht’s power management system and make autonomous decisions to reduce fuel consumption. Just under 50 metres, the superyacht known only as Project DRD is also nearing completion at the Mengi Yay Shipyard. 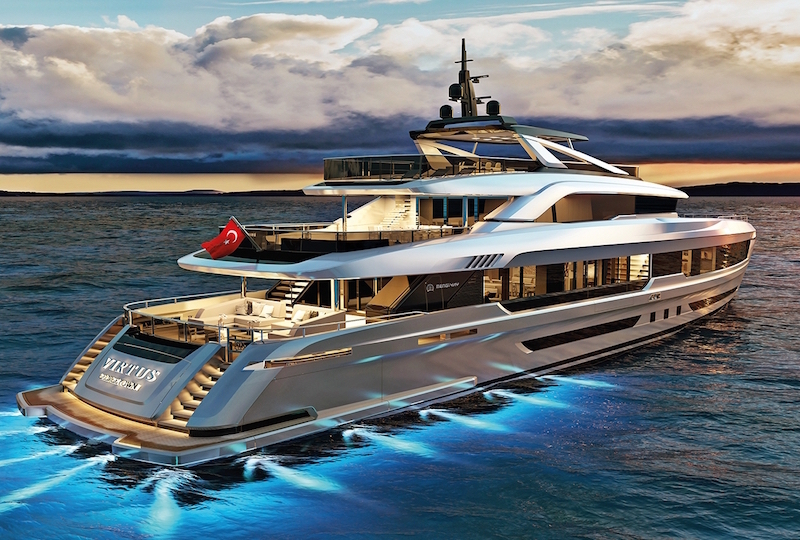 Although few details have been released regarding the exciting new build project, the yacht features design by the Turkish design studio Adeo. She will be delivered to her new owner later this year. With a wealth of innovative initiatives well underway at Mengi Yay Shipyard – as well as plenty of exciting large yacht builds to keep them busy – it looks like the Turkish shipyard is set to retain its position as a key player in the Turkish yacht building business for the future.